I’m not exactly sure why but the upper trapezius gets a bad rap. At least in the internet world it seems doing anything working the upper traps is considered heresy. Being “upper trap dominant“ consistently seems to be considered responsible for causing shoulder pain. In actuality though, at least in my experience, the upper traps are rarely strong enough. They are often excessively lengthened and weak, especially in women. Before you say to yourself, “But I always feel tight in that area” give this post on muscle length a read. In terms of postural alignment this is covered pretty well in the above link. Give that a quick read to get an idea of whether your traps are long or not. In terms of movement, the upper traps don’t always make themselves obvious during assessment. Furthermore, doing this yourself is not quite as easy as other muscles. Don’t get discouraged though, typically just by looking at the alignment of the shoulders and upper traps you can already conclude if they need work or not. However, If you’d like to assess their movement: lift your arms as high as you can in front of you, then bring them down. Do this a few times and watch your upper traps as well as how high you are able to bring your arms up. Do the same thing but bring your arms up from the side. If you are watching someone else and you watch them from the back, not only will you see the shrugging around the neck, you’ll actually see a lot of work being done by the rhomboids. This is despite the fact the rhomboids are not meant to elevate the shoulder. Rather they are meant to downwardly rotate the scapula. Of course, the left shoulder is the one that gives this woman pain. Again, this isn’t the easiest thing to spot if you don’t have a trained eye. In all honesty though, if you notice your shoulder or shoulders are hanging low and you have shoulder pain there is a very good chance your upper traps need work. In this girl’s case the difference isn’t substantial but it’s enough the dominant rhomboids cause her to have a chronic tight feeling around her upper back. If you have any shoulder pain during this exercise then simply bring your arms down to a height where they don’t hurt and shrug from there. Do that until you are able to bring your arms higher. Lastly, be aware of things that constantly pull your shoulders down during the day. For women, moving your bra straps closer to your neck rather than way out on your shoulders helps. Making sure not to carry purses or suitcases always on one shoulder, etc. Other little things such as making sure the arms are propped up nicely on arm rests or pillows while sitting, typing, driving, can make a big impact as well. Shoulder pain and neck pain are the main two, but plenty of other areas can be associated such as abdominal and mid-back. This is a pretty easy one: If you’re walking around like a hunchback or have kyphosis of your upper back, your upper spinal erectors need work. If you’re not quite sure you fit the bill, try standing with your back on a wall. Have everything from your lower back to your upper back and head against the wall. If you can’t do this and or it’s extremely hard for you, then your posture and upper spinal erectors could use some strengthening. Note that this is in contrast to the lower spinal erectors, which are typically too tight on a lot of people. The above exercises for the upper traps against a wall work great. Simply standing against a wall and practicing having everything from the lower back to the upper back and head being flat against the wall. Oh, and do what your parents said: Sit / stand up straight! Lower back pain, hip pain. 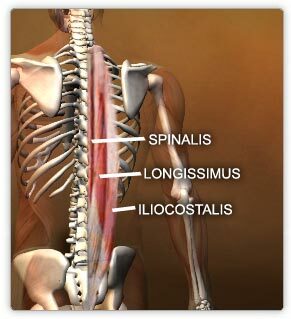 In my post on common tight muscles I talked about how tight lats can cause the lower back to excessively arch. 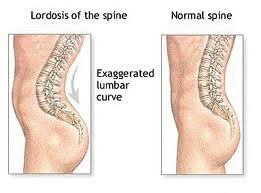 When the lower back excessively arches the external obliques excessively lengthen. Therefore, we want to strengthen and tighten the external obliques to help offset the dominant lats and lower back muscles. The two most common ways I assess the external obliques during movement are the same way I assess whether the lats are tight (found in the post on common tight muscles) as well as a leg raise test. For the leg raise test lie down on your back with your arms overhead. Straighten your legs upward, then lower them as low as you can. If your lower back comes off the ground at any point and you’re not able to keep it flat on the ground then the external obliques need strengthening. Because they aren’t strong enough to hold the pelvis in neutral alignment, the body arches the lower back trying to use the lower back for assistance. Quick tangent: This is VERY common and evidence that, in at least 9 out of 10 people I see who have some history of lower back issues, their lower back does NOT need to be strengthened. In fact, everything but the lower back typically needs to be strengthened to help alleviate the lower back from having to help out during exercises, such as leg raises. Pretty simple here. Simply perform the arm raise and leg raise exercises but make sure the lower back doesn’t come off the ground / wall at any point. Most importantly, walk with better posture with a neutral pelvis alignment. On another note, don’t bother with crunches, Russian twists, or any of that other crap. Most of the typical exercises people use to work the obliques work the internal obliques more than the external obliques. Without going into too much detail, when the external obliques are weak the internal obliques are typically plenty strong, thus an imbalance is already present. One which will only get worse by doing things such as bicycle crunches. For some reason, the obliques (int. vs ext.) confuse the crap out of me. Say someone had a weak external oblique just on the left side (part of a weak AOS). Would side plank (on the left arm) be the best exercise for strengthening that? Also, for a low shoulder. Does tight obliques one just one side contribute to that? Thanks – great work man. Don’t feel bad, the obliques can be very confusing. I would never really try to deduce if someone has only a weak left external oblique. It’s too convoluted to try to get to something like that. I’ll use your example of someone with a low shoulder. Let’s say their right shoulder is low. If the right obliques are pulling the torso into lateral flexion, then the left side may not be working enough to offset this. Unfortunately, it’s rarely that simple as the obliques also play a role in rotation. Typically, when someone is excessively flexed to one side, they’re rotating too much too. Back to the right side of the obliques: The external and internal rotate in opposite directions. The external rotate the shoulders to the left; the internal rotate the shoulders to the right. The external rotate the hips to the right; the internal rotate the hips to the left. In the above person, his hips are excessively rotating to the left when he bends his shoulders to the right. So, while his right side obliques may be doing too much in lateral flexion (with the low shoulder), they are asymmetric in how they’re engaged in rotation. Long story short, you can’t simply say “The obliques are overactive.” Or one oblique is weak. Using this guy as an example, in lateral flexion, you could perhaps say that. He is bending too much to the right after all. But in rotation, you can’t. Because one oblique is doing too much while another isn’t doing enough. 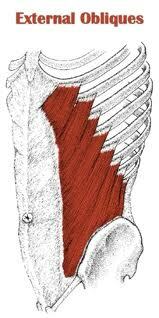 Not to mention we haven’t gotten to other muscles which can play a role in this, such as the lats. Anatomy can be helpful, but it can also be too much to bother with. In this scenario, with a guy like the above, you don’t go “We need to strengthen this muscle.” Instead, you go, “We need to improve how you side bend.” Namely, you don’t allow his hips to move when he side bends, which will work on whatever imbalance he may have, if any. There is no best exercise, there are just better ways of moving. Sorry, I know this is confusing. I have notes on a post for this topic, which would make things easier as I have more visuals I’d use. Someday I’ll write that post. This is what I was having a problem with. I have been using landmines and wide stance anti-rotation (to the left) to address a weak left external oblique and second guessed that rehab after you said “Most of the typical exercises people use to work the obliques work the internal obliques more than the external obliques”. Now I see that you were talking about the opposite side internal oblique (right?). Your knowledge fits right into my dysfunction. I have a anterior oblique system that is weak as well as one side of the posterior obliques. Both my knees drift towards the right which means I need a stronger pull with my left external oblique (right?). This is good news. Thanks for the knowledge bombs, man! What I’m saying is a particular exercise can’t iron this type of thing out. How you move during various exercises can. In terms of people doing exercises working the internal obliques more than the external, that was in reference to crunches, bicycle crunches, etc. In the context of this post, I was saying the external obliques typically aren’t working as well as they should. Whereas the internal are. This is in reference to how most people tend to excessively extend their back. The EO can offset this extension, but people need to learn this. I didn’t get into the rotation in this post as it’s messier, more technical, and beyond the scope of this post, which I wanted to keep simpler. I’m not sure what you mean by an anterior oblique system which is weak. The external obliques posteriorly tilt the pelvis; the internal obliques anteriorly tilt. (You could probably make an argument this depends what section of the muscle we’re talking about. Inferior, middle, superior, etc.) They both connect anteriorly, but do opposite functions. Say you’re using something like a straight leg raise to assess the obliques. You can’t have both obliques be weak in that movement. That is, the pelvis can’t excessively anteriorly tilt and posteriorly tilt at the same time. It has to be one or the other. It sounds like you’re referencing this “the anterior core is weak” stuff I see too many others claim on the internet. Quick dispelling of that: I see this often referenced, yet at the same time excessive kyphosis / trunk flexion is referenced. The obliques can flex the trunk. So, according to the first scenario -anterior core is “weak”- the person should strengthen their anterior core. Yet, according to the second scenario -excessive kyphosis- the person should weaken their anterior core? Maybe we do know how to make it add up. Maybe, given enough thought, one could figure it out. I’m skeptical, but feel a good deal of it could probably be done. Even then, it’s just unnecessary. If you’re kyphotic, work on thoracic extension. If you extend your lower back too much, work on getting rid of that. If you are kyphotic and extend your lower back too much, do the opposite of both. Sorry, not the whole system but only one side. [+] Right EO and left adductors are extremely tight (so I’ve been using unilateral movements to address the other side. [+] Left Lat and right glute are extremely tight (so I’ve been using unilateral movements to address the other side). Basically, the problems you would find in a right handed and footed desk jockey who has their mouse too far out in front and also sleeps on their right side (don’t worry, i’ve fixed these haha). For the longest time (see:18 months), I was addressing my dysfunctions in a balanced, bilateral manor. It wasn’t until I read your lateral pelvic tilt article that it dawned on me that I may have something going on side-to-side (and I definitely do). Anyways, I’m about 4 weeks in with rehabbing the POS and 1 week into the AOS. So far, fantastic. I know the real victory is in changing my sleeping/standing/sitting/walking but right now, my weak sides are so dead that I really do have to focus on the muscles just to get them to turn on (so thats why I asked about the side plank). And yes, focus on quality never changes. Your article completely ignores the lower body. You did not explain why. Hi i wanna ask about the pull of the function in TFL and EO in lateral pelvtic tilt i have scoliosis its structural thoracolumbar part t but middle its not big and the curve is in my left side so left side is anteriorly pulled more than my right side, right shoulder lower that left, and the left lats with upper trap and levator scapulae are dominant but i have rounded shoulders with slight kyphosis, so the left obliques are holding the crap of my rotated spine in left with my left QL and erector spinae which are more developed thand right so my question is- When i try to do the abs breath i mean like vacuum and my left side is getting spasm in the obliques its near the iliac crest and i cant breathe sometimes because of that dominant side my right is weak (EO with internal obliques) my hips are extended and when i walk i feel spasm in my left QL with left obliques going all above erector spinae and iliac crest, if i walk with loosed abs no contraction in the lower abs i get too much spasm in left QL and left obliques because the obliques contract with my QL, so what can u recommend for unliteral exercise for weak oblique and kind of idea when i tighten my abs back to release my erectors how to do that without using my left oblique doing the whole work?Also because i have structural scoliosis its like 10 degrees and does my psoas would pull the the back more anteriorly on left side or its weak and lenghten because i feel pain in the flexor i mean the hip is already extended i think my TFL on left does something wrong, so i have to strenght my psoas in left,right side both ? I have developed TFL in my hips because of running and my left gluteus maximus is weaker than the right,the right is often pulled down and the hip is abducted with lateral rotation of the tibia, the left leg is internal rotated(adducted) at the hip and the tibia there seems interal rotated.. i have pronation of the right foot and when i walk my tibia is not leeting my feet in plantar flexion i mean is it normal to walk with dorsiflexion? i have developed tibalis anterior but my calfs arent good they are not working in plantarflexion,i have more eversion both of legs..
Forgive me, but this was a bit tough to follow. As far one of your questions, I’m not sure I’ve ever recommended an exercise aimed at strengthening one oblique. That’s not really how the obliques work. This gets technical and is probably beyond a comment reply. It’s on my list of things to write about. I love all of your info, and how specific it is. A lot of your information goes against the corrective exercise certification I have received (which I won’t name here) – In particular your info about upper traps being underactive in this article. I have had nothing but shoulder issues since I started trying to reduce my upper trapezius activity. Everything has fealt unstable with frequent popping – especially in extension of the humerus. I don’t know if thats cause or coincidence. Thank you for all the information you provide for free. Thanks for the nice words Jason! The upper trap conundrum is a common one. I think since I wrote this the thought process has shifted some, but there’s no doubt for a long time, and a lot of people still, harp on *not* working the upper traps. Sometimes they don’t need some work, but quite a bit of the time they do. It’s more the idea of “shoulder pain = upper traps are too active” is way off base. Nice article! I also have this anterior pelvic tilt and my external oblique are spasming almost constantly on my right side. I simply can’t do leg raises because it hurts so much on my right side of external oblique. You can give me some advice what will i do? The exercises in there are easier than the leg raise in this post. They start out quite easy, then progress week by week, getting decently hard, but still not as hard as the leg raise in this post. I am SO glad I have found this website. I have been dealing with what feels like a chronically tight right shoulder. I have had numerous massages on my right rhomboid and the area feels tight the next day. I saw the video you have about rhomboid dominant shoulders and I feel that is the case with my right shoulder, which makes stretching my right side difficult. I plan to use the overhead shrug to help my rhomboid dominant rt shoulder. My problem is flexibility/mobility. My arms overhead do not line up with my ears, tight lats are my guess. With continued use of the overhead shrug and stretching, Will this help increase my shoulder ROM? How often should I do this and any other suggestions to increase overhead mobility? Because when my arms are over head they lean forward instead of paralell with my ears if that makes sense. I greatly appreciate any help you give me. Thank you for sharing your knowledge on this platform in such a manner that us everyday gym scrubs can understand, comprehend and internalize a lot of it. 1) When I was young I started lifting weights to get a bigger chest. I had no idea of form/technique and the impression I get from retrospect is that I literally pressed myself flat into the bench, using my lats and delts and tris (with chest at a minimum) to do presses on the bench. 2) I spend a lot of time infront of my computer which leads to bad muscle imbalance, irrespective of weight training and other physical activities. My work requires me to sit and I play video games. I have made some good progress on my muscle gaining journey but I realize that my posture has taken a hard hit due to an over-zealous and uninformed approach. I used to be very flexible but not so much anymore. My pecs have been developing uneven due to this imbalance (as an example). 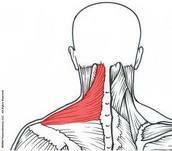 There is a lump of muscle towards the outer edge of my pecs which tie in with muscles in my neck. In contrast, my inner chest seems underdeveloped for the amount of years I’ve been training and the progress that I’ve made on the rest of my body. 1) Can I continue with a split bodybuilding routine whilst trying to bring my traps back? (heavy weights, trying to gain weight). 2) Would an OH BB Press be a good way to build the traps and rhomboids (which I think are the two main culprits)? 3) How do I approach bench pressing now? I’m assuming the only way to bring back my traps would be to drop the weight rather significantly on the muscles (pecs/ delts / lats) which are overpowereing the traps at the moment? It also quite difficult to work out my back as my lats usually compromise for the rest as it feels not as strong as my lats. If I can try and give you a visual representation, although people might not be able to see it as clearly when looking at me: it feels as if there is a point, roughly 150 inches away from the middle-point of my upper body (between my pecs/abs) which is pulling all my muscles towards it. In contrast, my traps feel sore and overburdened by this pulling. When I stand in the correct posture infront of the mirror I look a lot more muscular. My shoulders are round, pecs look even etc. But my usual everyday posture looks bad in comparison. Sorry for the long write! I am looking forward to your response. 2) Not really. Overhead pressing, when done properly, shouldn’t be hitting the rhomboids much. The rhomboids are downward rotators of the scapula, but in an overhead press the upward rotators are what’s (hopefully) being targeted. You likely want to be not hitting the rhomboids much right now. -Trying to target one aspect of the chest over another is a very tough thing. I’m not sure I’m aware of anything that seems worthwhile in this regard. (If you know of something, feel free to pass it along.) These types of things seem largely genetic, unfortunately. Hi, thank you so much for these information. Your article and replying comments to others were very helpful to understand external oblique’s movements and now i can assess and strengthen it. I have swayback; tight upper rectus abdominis and weak external oblique. I’m trying to fix swayback because I have a chronic pain in my sitting bone presumably referred from tight hamstrings. I’m wondering if leg raise also strengthens upper rectus abdominis, is it ok to do that though I have relatively strong rectus abdominis? When I do leg raise, I also feel they’re tight as well as my weak lower rectus abdominis and external oblique. If you did leg raises like outlined in the article, they could be worthwhile. I would view them more in terms of countering the posture you’re trying to correct. For instance, if you feel you are kyphotic and the hips swing in front of your shoulders, then the leg raises could help extend the upper back some, and, as the legs move, work on not allowing the hips / lower back to move forward. In other words, I’d view this more as avoiding whatever posture it is you’re trying to avoid, opposed to trying to specifically work one muscle. It’s not so much what you do, it’s more how you do it.